High School goals: Carmella has been on a college-preparatory track taking many honors and AP classes. Her choice of electives are anything art or music-related. Other interests/activities besides bowling? Carmella is a member of the Thespian Club and works on the stage crew with costumes for the fall plays. She also is very involved with anything related to the band. 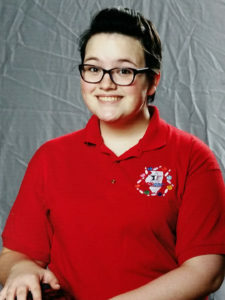 She plays the euphonium or the trombone in the marching band, pep band, pit orchestra, jazz band, and also the vibraphone in the Indoor Percussion ensemble. She is also a very talented in yarn arts and has a successful side business crocheting hats and scarves for family and friends to support her expensive extra-curricular endeavors! What kind of college are you looking for? Carmella is looking for a school where she can pursue a degree in Physics and hopefully bowl at the collegiate level.